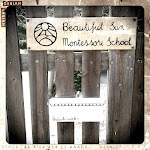 Beautiful Sun Montessori: "Believe in the child." We are getting to the end of our Spring Break and preparing for the last seven weeks of school. At this point, I reflect on the journey we've had this year at school and on the individual progress each child has made since August. During the break, I meditated on each child, especially on those with who for some reason or another this year I had moments of disconnect. Instead of leaving this work for the end of the school year, I thought it might be fruitful to stop now and acknowledge each child in my mind while there are still some weeks left in the school year. Recently, our Conscious Discipline teacher, Helen, visited me at school and we discussed the subject of "positive intent." It is one of the pillars of the CD program, and basically means that if we dedicate ourselves to seeing the best in others, and in cultivating a vision of the child's best self, it is possible that they may see it too. We both agreed that it is a challenging but crucial part of our work as teachers to foster the best mental image of a child as we can. Children are developing their self image based on the messages they are receiving from the world around them. I'd like my message to be one of genuine encouragement, even at my worst moments. Perhaps this was instigated by reading "The Creative Development in the Child" chapters 26-29 where Montessori discourses at length on children's possible deviations and gives examples of what they look like in the classroom: "a child who is disorderly in movement", "who is very noisy", "speaks in a very loud voice",""putting the Buttoning Frame around his neck", "runs from one side of the room to another jumping over the Long Rods" familiar to anyone? "How long does this correction [normalization] take? It all depends upon the child. Sometimes it takes a week, sometimes a month, sometimes even a year." There is still plenty of time. "She must believe in the child, she must understand that the child loves to work. She must have in front of her eyes, the impressive picture of a child who when left free to concentrate on work, gives every atom of energy to the task upon which he concentrates." Such a positive and encouraging post! Thanks! Thankyou.This reminds me Phylis Wallbank's lecture in Adelaide, Australia. "Spotlight the good and the good will grow" It is there. Thankyou. This reminds me of Phylis Wallbank's lecture in Adelaide, Australia where she reminds us to "Spotlight the good and the good will grow." We must have hope in the child. It's great to freshen your perspective, no matter what time of the school year it is. Thanks for sharing such powerful words. Susanne, thanks for all your posts. I learn so much from your blog! I would like to be able to use more Conscious discipline in my classroom. Would you recommend the book "Conscious discipline" or some other book or CD by Dr. B.Bailey for self training? The book by M. Montessori, you mention in this post, is rather hard to find, isn't it? Sorry for the delay! I would recommend the book "Conscious Discipline 7 Basic Skills for Classroom Management". Also, Dr. Bailey just came out with a new book specifically directed at teachers which I have not read but am interested in getting my hands on.